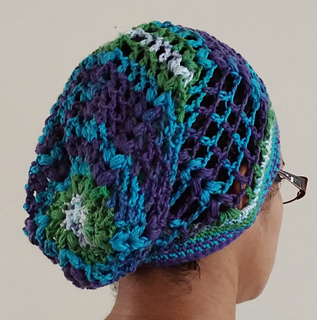 Small - 19-21"; Med/Large - 22-24"
This slouchy puff hat uses the puff stitch in a v-stitch style. It is open and airy making it perfect for summer evenings. The band will fit comfortably around your head but not too tight. 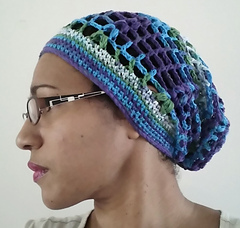 It has a soft drape that reaches the nape of your neck giving it a nice puff and slouched style. Any #2 sports weight yarn should work.